Heat oven to 350°F (325°F for dark or nonstick pans). Grease and flour two 8-inch round cake pans, or spray with baking spray with flour. In large bowl, beat cake ingredients with electric mixer on low speed 30 seconds, then on medium speed 2 minutes. Pour into pans. Bake and cool as directed on box for 8-inch rounds. Refrigerate layers about 45 minutes for easier handling. Trim off rounded top of one layer. 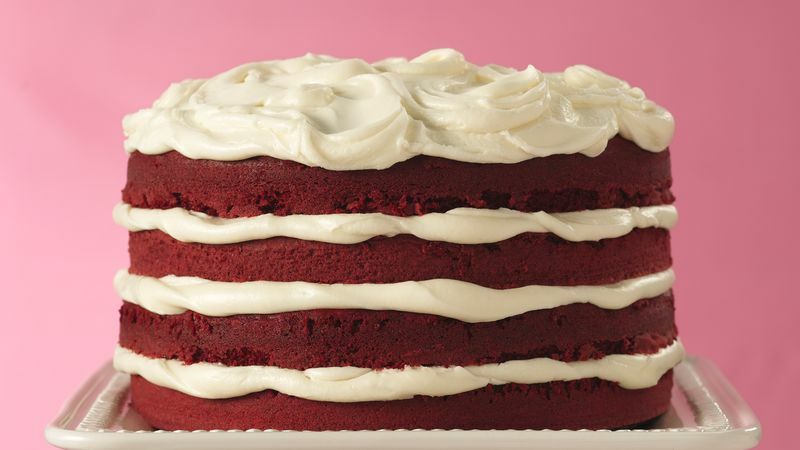 Slice each cake layer in half horizontally to make a total of 4 layers. Reserve untrimmed top layer. In medium microwavable bowl, microwave baking chips uncovered on Medium (50%) 4 to 5 minutes, stirring halfway through microwave time. Stir until smooth; cool 5 minutes. Stir in frosting until well blended. Place 1 cake layer bottom, cut side up, on serving plate; spread with about 3/4 cup of the frosting. Repeat with second and third cake layers. Top with reserved cake layer, cut side down; frost with remaining frosting. Store loosely covered. Splitting cake layers is easy. Insert toothpicks around side of cake layer to mark middle point. Using toothpicks as a guide, cut through the layer with a long, thin, sharp knife. For a double-chocolate cake, use semisweet chocolate chips instead of the white chips and Betty Crocker® Rich & Creamy chocolate frosting instead of the vanilla frosting.